Oil Crisis is a 4-Player Mic minigame in Mario Party 7. The term "oil crisis" references the 1973 oil crisis that occurred when the price of oil skyrocketed due to an embargo on the part of OAPEC. The four players are shown waving at the screen while standing in front of their cars. 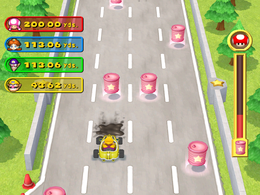 The players must navigate their car around the oil spills (which will slow them down) and collect pink fuel cans to get to the finish line. During their turn, they also have the opportunity to use their mushroom and receive a speed boost (similar to in the Mario Kart series) by shouting "Mushroom" into the mic; however, this can only be done once. The finish line is 200 meters/yards away from the starting point. If the player runs out of fuel, they stop and their distance is measured from where they are to the starting point. The player who gets the farthest is the winner. If more than one player crosses the finish line, then they all win. There are no ties. The winner(s) stand in front of their car at the finish line and perform their victory animation. Mic – Say: "Right", "Left", "Mushroom"
Rules – "Drive your kart by shouting commands into the Mic. Don't run out of fuel before you cross the finish line." Advice – "The "Mushroom" command will give you a burst of speed, but you can only use it once. Plan ahead!" This page was last edited on August 5, 2018, at 13:54.